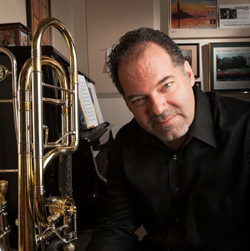 Brent Phillips is Associate Professor of Trombone at Baylor University. Prior to his position at Baylor, Mr. Phillips was assistant principal trombone of “The President’s Own" US Marine Band in Washington DC for nine years and is currently principal trombone of the Waco Symphony Orchestra in Waco TX and the Abilene Philharmonic. He is currently playing the 2015-2016 season with the Dallas Symphony Orchestra. Before moving to Waco, he was the principal trombone of the Harrisburg Symphony Orchestra for 15 seasons while concurrently performing in the Marine Band. In addition to performing, he has been invited as a repeat clinician and soloist at the Eastern Trombone Workshop, Alessi Seminar and Trombonanza in Argentina. Mr. Phillips founded the “Mountain Light Music Festival - Trombone Summit" in Pagosa Springs, Colorado which involves a fellowship of professional performers, artists, faculty, and students in a high altitude wilderness setting. Mr. Phillips studied with David Waters, David Kirk, and Alan Barnhill and earned both his Bachelor and Master of Music degrees from the Shepherd School of Music at Rice University.